Several years ago my sister sent me a recipe for vegetarian crab cakes. This was when we both lived in Washington, DC. When you live in that part of the country, it kind of seems like your duty to find a good crab cake recipe. I’ve since moved to Chicago but I still make these veggie crab cakes all the time. The base is a mixture of shredded zucchini and panko bread crumbs. Then you add lots of flavor with Old Bay seasoning, fresh garlic and parsley, Dijon mustard, lemon juice, and Greek yogurt. Form the mixture into small patties and cook ‘em up. So simple! They are very moist and hold their shape really well in the skillet. I especially like to make these little guys in the summer with zucchini from the farmer’s market. The original recipe was actually from a newspaper article about ways to use up summer zucchini. The article’s author refers to a well-known Garrison Kiellor quote about zucchinis and country life. Do you know this one? The only time of year when Lake Wobegon residents lock their car doors is summer so neighbors won’t leave bags of zucchini on their back seats. I haven’t found any mystery bags of zucchini on my apartment doorstep yet, but my veggie drawers in the fridge are always full of zukes these days. It is a favorite vegetable around here. And this recipe is an excellent way to use them up. We usually eat these cakes with a garlic + lemon yogurt sauce. This yogurt sauce is pretty much a staple in our kitchen, so I included a recipe for it below. Other suggested toppings for your cakes: a squeeze of fresh lemon juice, chopped fresh basil, tartar sauce, a dash or two of your favorite hot sauce. 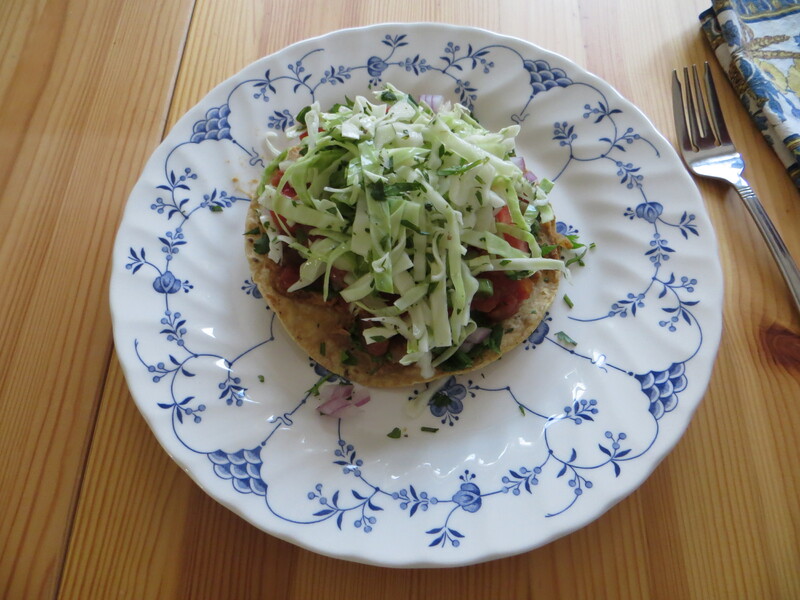 They also go really well with a tomato + onion salad on the side. Something I haven’t tried yet is using these cakes as a filling for a little sandwich. Maybe with some butter lettuce, tomato slices, and a schmear of avocado? So many possibilities! Just a few notes. I really love whole-wheat panko here, but feel free to use whatever kind of bread crumbs you like. It’s difficult to say how many zucchinis you will need to get 2 cups shredded. Maybe one big one or two smaller ones? Zucchini math is an inexact science. I recommend shredding up a little more than 2 cups because you do lose some during the transfer from towel to bowl during the squeezing step (described below). And finally, I always double the recipe when I make this so there are leftovers. As written, this recipe makes 8 small patties, which I find serves two people as a main course. If you double it, you should get 16 patties, which will serve two people for dinner and then again for lunch the next day. Shred your zucchini however you’d like; I always do it by hand with a box grater. Do this over a big cutting board because the little shreds like to fly around, in my experience. When you’ve got 2 cups worth (or a little more, see above note), the next step is to get the zucchini as dry as possible. My method is to place the shredded zucchini in a tea towel and squeeze the water out over the sink. This is the same method I use to squeeze water out of frozen spinach. I have a dedicated “spinach towel” in my kitchen because of its permanent green stain, and that’s the one I use for the zuke squeezing, too. There are other methods for getting water out of zucchini. The original recipe instructs you to put the shredded zucchini in a colander, sprinkle with salt, and let it sit for 30 minutes. I’ve tried this, but I always end up giving it a good squeeze anyway at the end. So now I just use the towel method and avoid the colander step entirely. Place the dry shredded zucchini in a bowl and gently stir in the bread crumbs. Next, put the garlic, lemon juice, parsley, mustard, yogurt, and Old Bay in a small bowl. Add the beaten egg and stir everything up. Add the wet ingredients to the zucchini mixture and gently stir so everything is thoroughly combined. Form the mixture into 8 small patties. Heat a small amount of oil in a skillet (I use a cast iron skillet for this). I usually start with 2 tablespoons of oil and see if I want to add more. When the oil is hot, carefully add the patties and cook on both sides until brown. When I remove the cooked patties from the pan, I place them on a paper towel-lined plate to cool a little. I recommend serving these little guys with small dollops of lemon + garlic yogurt sauce (recipe below). Enjoy! Put the yogurt into a small bowl. Use a microplane zester to grate the garlic clove directly into the bowl. If you don’t have a microplane, you can just mince the garlic up really well. Just make sure the pieces are tiny. Add lemon juice and salt. Stir it all up. That’s it, you’re done! Other additions that make this sauce sing: chopped scallions, chopped fresh parsley, cilantro, or dill, chopped cucumber, or a dash of cumin powder. 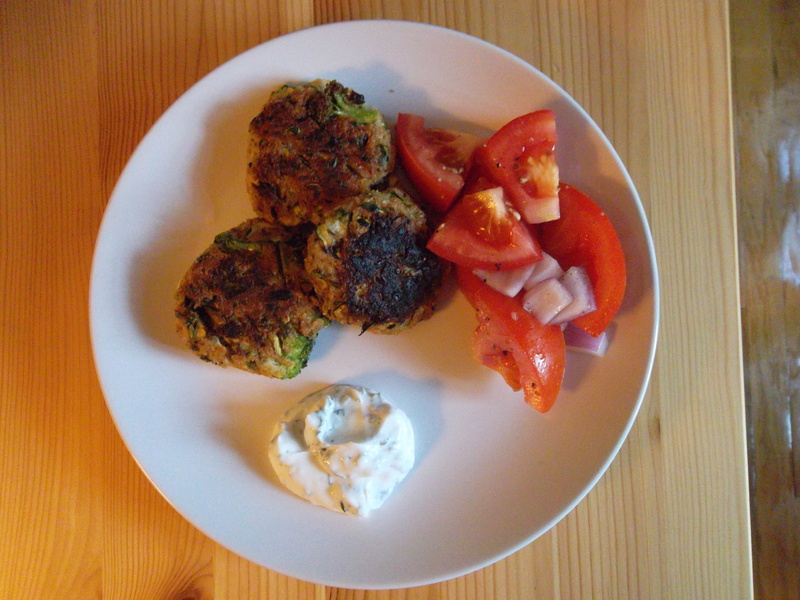 Categories: summer meal, yogurt, zucchini | Tags: summer meals, vegetarian crab cakes, yogurt, zucchini | Permalink. I make this salad all the time in the summer. It’s got couscous and chickpeas tossed with lots of fresh ingredients, like cucumbers, tomatoes, green onions, and cilantro. There’s a good amount of freshly-squeezed lemon juice, some salt + pepper, and a touch of olive oil. I also add feta, but that’s optional. My strategy is to make a big batch of this salad in the morning, and then snack on bowls of it throughout the day or pack it in a container to bring with me. This salad travels really well. I mostly take it to libraries. When I was in grad school, I did most of my work in libraries. I needed lunch options that were portable, easy to eat while staring at Word documents on my computer, and didn’t require any more refrigeration than library air-conditioning provides. This salad covered all those needs. As it turns out, I still do most of my work in libraries in my post-grad school life. So, I’m still making and eating a lot of this salad. This one is a no-brainer and endlessly customizable, I think. Not a fan of cilantro? Add something else, like chopped mint or parsley. I made a batch of this salad the other day and my cuke was looking a little worse for the wear, so I subbed chopped raw zucchini instead. You could throw some nuts in. When I don’t have lemons on hand, I just use a couple of shakes of red wine vinegar instead. You get the idea. I didn’t include exact amounts for the veggies because you can really do what you want. I mean, it’s your salad, do what you like! I included suggested amounts of lemon juice and olive oil even though I never measure anything when I make this. I usually use the juice from about 3 lemons, depending on how juicy they are. I like this salad on the lemon-y side. And I definitely use just a touch of olive oil. Adjust for your own tastes, of course. First, make the couscous. Put the uncooked couscous with the salt in a bowl large enough for the entire salad. Add 1 cup boiling water and put a plate over the top of the bowl. No need to stir! Let the water do its thing with the couscous for about 5 minutes. Then, take the plate off the top of the bowl and fluff the couscous with a fork. Then, prep all of the other ingredients and just toss them in as they are ready. Add the lemon juice and olive oil at the end. Add salt + pepper, to taste. Have a small bite and see if you need to add more of anything. If I’m storing the salad to eat later, I find that I sometimes need to add more lemon juice before eating to perk it up a bit. 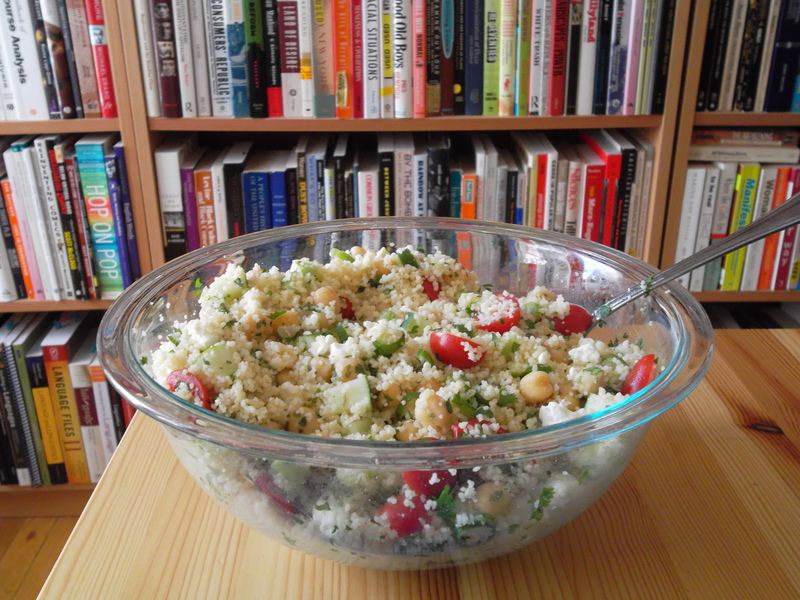 Categories: chickpeas, couscous, easy, feta, salad, summer meal | Tags: couscous, salad, summer meal | Permalink.